Cornelius B. Murphy, Jr., Ph.D., President of the SUNY College of Environmental Science and Forestry, was named the recipient of the 27th annual Rhea Eckel Clark Citizenship Award at the Central New York Regional Planning and Development Board’s annual meeting held on December 10, 2013. Dr. Murphy began his career by obtaining a bachelor of arts degree from St. Michael’s College and a Ph.D. in chemistry from Syracuse University. Following his academic work, Dr. Murphy was employed by the O’Brien and Gere Companies, where he rose through the ranks to become President in 1993. Following a seven year tenure in this leadership position, Dr. Murphy returned to his academic roots and became President of the SUNY College of Environmental Science and Forestry from 2000–2013. Dr. Murphy’s community service includes board membership on the Upstate Medical University Foundation, Boy Scouts of America’s Hiawatha Council, CenterState CEO, Audobon Society of New York, Say Yes Scholarship Governance Board, and Co-Chair of the SUNY Energy Smart New York Innovation Team. Among his many awards, Dr. Murphy has been recognized with the Post-Standard Achievement award, the Salvation Army Community Spirit award, the FOCUS Greater Syracuse Wisdom Keeper Award for Citizenship Trustee, the Greening USA Sustaining our Community award, and the Adirondack Environmental Education Leadership award. The CNY RPDB held its 47th annual meeting on December 10, 2013 at the Doubletree Hotel in DeWitt. Approximately 125 members and guests from across the five-county region attended the holiday luncheon gathering. The keynote speaker at the meeting was Cornelius B. Murphy, Jr., Ph.D., President of the SUNY College of Environmental Science and Forestry. 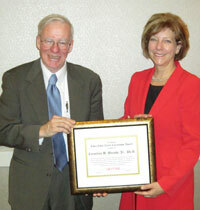 Dr. Murphy was also the recipient of the CNY RPDB’s Rhea Eckel Clark Citizenship Award. Special guests attending the meeting included Mary Eckel Shane and Katelyn McCarty, the daughter and great-granddaughter of Rhea Eckel Clark. On December 11, 2013, NYSERDA Cleaner Greener funding announcements were made through the NYS CFA/Regional Economic Development Council Program. A total of $30 million in funds was awarded through this initiative Statewide including $3.5 million for projects in Central New York. Projects receiving funding include a geo-thermal energy system to support a mixed-use development in the Syracuse Inner Harbor , infrastructure improvements for the proposed CNY 3Gi –Intermodal Rail and Inland Port, City of Syracuse Comprehensive Plan Zoning Update, and the CNY Regional Partnership for Comprehensive Planning Program. 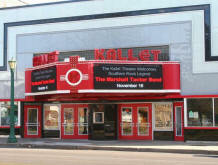 The Kallet Theater in the heart of the historic Village of Pulaski, after 30 years of decline and near demolition, celebrated its rebirth in November as a community event space for corporate training, concerts, movies, and social functions. Thanks to the dedicated efforts of a local businessman Vince Lobdell, the theater, is once again pumping life into the Oswego County community. The project would was supported with funding from New York State’s Restore NY and New York Main Streets Programs, as well as National Grid’s Main Street Program. The opening event featured the Marshall Tucker Band and the theater's events director is working to bring national marquee names to Pulaski, from country to tribute acts to comedians to dinner theater. The CNY RPDB supported the project through various planning, design and grant assistance services. CNY RPDB delivered five professional level training programs as part of its 2013 Stormwater Management Training Series. This training series provides private and public sector engineers, landscape architects, stormwater administrators, planners, and consultants with up-to-date techniques and tools for evaluating, designing and reviewing stormwater management plans and practices. The program emphasizes NYS standards based on NYDEC's 2010 Stormwater Design Manual, the NYSDEC Erosion and Sediment Control Manual, FEMA flood standards, and related permits, and also examines national standards and future trends. Over 30 municipal representatives attended the CNY RPDB’s workshop on November 21 at SUNY-ESF to learn about the incentives available through NYSERDA’s Cleaner Greener Communities Program for adoption of the NYS Unified Solar Permit, a streamlined application for installation of solar PV systems smaller than 12kW. Decreasing installation costs by cutting red tape for customers will help to accomplish the state’s goal to increase solar capacity from 120 MW in 2013 to 3 GW by 2023. Municipalities that adopt the streamlined permit can receive an incentive of $2,500 or $5,000 depending on population size. Applications will be accepted until September 30, 2014, or until funds are exhausted, through the Consolidated Funding Application (CFA). The CNY RPDB is available to assist municipalities to adopt the permit form and apply for the NYSERDA incentive. On October 3rd, 2013 the Village of Skaneateles celebrated the grand opening of the first municipal net-zero energy municipal building in NYS. The creation of the first municipal net-zero public building in NYS was accomplished with renovations that included a new geothermal HVAC system, complete building envelope renovation, LED lighting, and installation of a 54 kW Solar PV system on the roof. The village was awarded $546,000 for the energy efficient building improvements through NYSERDA. The $1.5 million project is expected to reduce energy usage by more than 62,000 kilowatt hours of electricity and result in the avoidance of 46 metric tons of greenhouse gas emissions annually. Planning for the project began over a year ago when Village officials partnered with the CNY RPDB under the agency’s EPA-funded Climate Change Innovation Program. CNY RPDB prepared a $1M grant request to construct NYS approved green infrastructure practices and a regional wetland complex to address stormwater management, water quality degradation, drainage/flooding and habitat loss in the five-county CNY region. The proposed project includes comprehensive planning, design, construction and ownership/operation components. The project provides an opportunity to establish strong public-private partnerships to effectively address environmental issues on a regional basis. The targeted practices will reduce energy used for wastewater treatment and cooling, and reduce greenhouse gasses through carbon sequestration and improve ecosystem services such as wildlife habitat and natural flood attenuation and water quality treatment. In August 2013, the U.S. Department of Transportation awarded a $1.5 million grant to the Port of Oswego for a new rail link that will create hundreds of new jobs. The federal funds will be used to finance upgrades to deteriorated rail lines dating to 1963 along the Port of Oswego's dock. The work will include the construction of a roadway, embedded with heavy rail track, connecting the port's main East Terminal to a 6-acre open-storage area to handle larger shipments of commodities. Oswego Harbor and the Port have the distinction of being the only deepwater port on the U.S. shores of Lake Ontario. The CNY RPDB’s assisted the Port with project planning and preparation of the TIGER application. The grant will leverage $1.75 million in matching funds, bringing the total project to $3.2 million and is expected to create 100 construction jobs. The CNY RPDB completed preparation, in partnership with CHA Consulting Engineers, of a conceptual master plan study to determine the feasibility of developing a modern rail freight and inland port distribution center serviced by rail on a 200 acre site located directly north of the CSX Syracuse/DeWitt Rail Yard. Elements of the study include an inventory of similar inland-ports in country, an assessment of existing environmental conditions, project alternatives and costs estimates, and presentation of a series of conceptual site plans. Funding for this project was provided by the federal Economic Development Administration. As part of its economic development program, the CNY RPDB completed preparation, in partnership with Barton and Loguidice Engineers, of a regional site profile database of 25 major development sites in the region. Information incorporated into the data base includes major site profile characteristics, visual mapping elements and conceptual site plans, and detailed site information. This database is designed to support local business recruitment and retention efforts. Funding for this study was provided by the federal Economic Development Administration and National Grid. In accordance with the strategies outlined in the CNY Regional Sustainability Plan, the CNY RPDB assisted communities across Central New York with the preparation of applications for NYSERDA Cleaner Greener Phase II implementation funding in August 2013. Applications submitted include funding request for a geo-thermal energy system to service the Syracuse Inner Harbor, a hydroelectric dam in Auburn, infrastructure improvements to service the proposed CNY Intermodal rail and inland port in DeWitt, a natural gas distribution system in Hamilton, plastics-to-oil recycling center in Madison County, expansion of the Onondaga Lake Loop-the-Lake trail, a green infrastructure initiative, and a regional municipal comprehensive assistance planning program. The CNY RPDB completed work on the CNY Regional Sustainability Plan in June 2013. Preparation of this comprehensive plan was done under the auspices of the NYSERDA Cleaner Greener Communities Regional Sustainability Program. Community representatives from across the five-county region organized the plan around several major public policy issues including energy, infrastructure, land-use, environment, economic development, materials management, and climate adaptation. As part of its C2IP, the CNY RPDB assisted with the completion of seven greenhouse gas inventories in municipalities across Central New York including the City of Oswego, City of Cortland, Village of Skaneateles, Madison County, City of Auburn, Town of Cazenovia, and Village of Fayetteville. The CNY RPDB completed an assessment of the net discharge of pollutants to impaired waters for 25 municipalities in the Syracuse Urban Area as part of the Municipal Separate Storm Sewer System (MS4) Phase II Permit Implementation Program. Using the Watershed Treatment Model developed by the Center for Watershed Protection, CNY RPDB worked with C&S Engineers and MS4 operators to complete a basis analysis (2008 data) and a first milestone analysis (2011 data)of Pollutants of Concern (POC) loading to impaired waters. The results of the analysis are being used to evaluate the effectiveness of each MS4’s stormwater management plan. Working in cooperation with the CNY RPDB, Syracuse Mayor Stephanie Miner announced the launch of the Syracuse Neighborhood Energy Challenge Program on March 29, 2013. This initiative welcomes neighborhood associations and community organizations to form teams and compete to receive a $5,000 grant through the Gifford Foundation for a neighborhood sustainability project. This program builds on the success of the 2012 pilot program held in Syracuse where participating homeowners reduced their electric consumption by nearly 30%. The CNY RPDB is expanding the program across the region with similar efforts being initiated in the Village of Skaneateles, City of Oswego, and the City of Cortland. The CNY RPDB was selected to be part of a statewide team formed by the NYS Economic Development Council to implement the New York State Energy Research and Development Authority’s (NYSERDA) EDGE program. The Economic Development Growth Extension Program (EDGE) offers regionally-based access to NYSERDA’s full range of programs including energy efficiency, renewable energy and research and development. Under the program, NYSERDA is working with Regional Outreach Contractors strategically located throughout New York State’s 10 regions to extend NYSERDA’s program outreach to commercial, institutional, municipal, industrial and residential customers. With assistance from the CNY RPDB under the C2IP program, the City of Cortland Waste Water Treatment Facility recently completed an energy efficiency improvement at the City’s wastewater treatment facility replacing four (4) 150-HP centrifugal blowers used for secondary aeration with three (3) 100-HP turbo-blower units. The CNY RPDB held an organizational meeting on February 20, 2013. Information presented included the organization’s planned operating budget and work plan for 2013. Major program activities highlighted included economic development, environmental management, comprehensive planning and community development, energy management, transportation planning, and a regional grants assistance, information, research, and communication service. Board members elected to serve as officers of the organization in 2013 included Kathleen Rapp – Chairwoman, L. Michael Treadwell- Vice Chair, James Murphy – Vice Chair, Vijay Mital – Vice Chair, and James Rafte – Secretary/Treasurer.